Well even though I had grand plans for the week in the shop they never really came to fruition. I spent very little time in there at all in fact. I did at least do some work on the table saw at work though and made a few shelves for our office coffee/kitchen cart. The time I did get to spend working at home did not even take place until today, my wife has been asking me to do some work on the raised garden beds I built a few years ago for her. She has bought some netting in order to make a trellis and needed a frame attached to the back of the largest box. So after a quick trip to the “orange place” I was able to make her a nice sturdy frame for her trellis. As well as help fasten in the eye hooks to define the garden space. She has taken up “Square Foot” gardening hence the measured out plots. Perhaps I should post this as a project over at Garden Tenders. Well maybe I will. Anywho, not a whole lot more to say this evening. Looking forward to some tree work at work this week so I should be adding to my wood pile a bit, perhaps work on some green turnings. Until next time, have fun in the shop all. 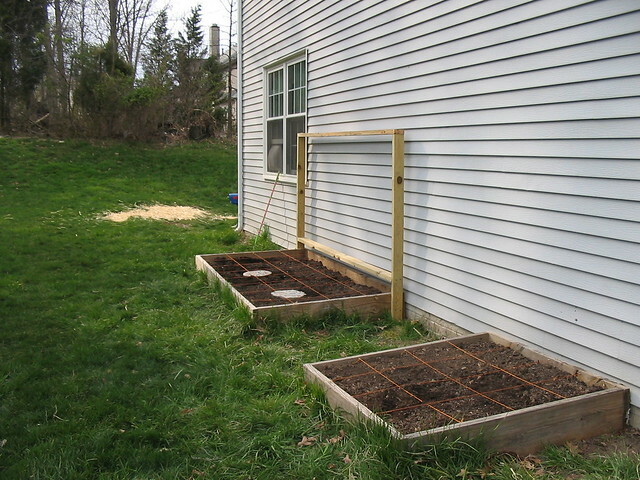 I’ve read about this square foot gardening, have you been trying it long?